Daryl Murphy netted the winner against Swansea on Saturday. Forest produced a real smash and grab victory over Swansea City at the weekend but at this stage of the season points take precedence over performances. Like almost every other Nottingham Forest supporter, I left the City Ground wondering how on earth we’d managed to beat the Welsh side having been outplayed for most of the contest. Despite the deployment of a 4-3-3 system, Martin O’Neill’s midfield three of Yates, Watson and Colback hinted at a somewhat industrious approach to the game as opposed to flair. After a steady start the Reds began to look like the away side as Swansea racked up possession stats of 70 percent and above, which seemed criminal in front of yet another sell out crowd. But for the brilliance of Costel Pantilimon saving Matt Grimes’ long-range effort, the home side could have gone in trailing at the break. One young man in particular caused Forest a world of trouble; 21-year-old Wales international Dan James was unplayable at times as he ran riot down the left flank. Such was his threat level that it took a combination of Tendayi Darikwa and Matty Cash to quieten him down in the second half. The complete lack of creativity from Forest prompted O’Neill to bring on Carvalho and Murphy for Watson and Lewis Grabban respectively. Whether it was aimed at the withdrawal of Grabban or the introduction of Murphy I don’t know, but the fact that the change was greeted by boos is beyond comprehension. Grabban hadn’t kicked a ball since mid-February and was understandably not fit enough to last the 90 minutes. Murphy on the other hand may not be everybody’s cup of tea, but provides a decent threat coming off the bench. The change didn’t seem to alter the flow of the game as Swansea took their deserved lead on 76 minutes. Amazingly, 11 minutes later Forest were 2-1 ahead and wrapping up three points which would close the gap between themselves and the play offs to just a couple of points. Two cracking headers by Murphy and Molla Wague would be the telling difference. 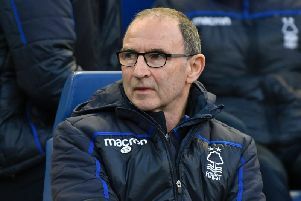 Whilst I’m honest enough to admit that it was a very poor performance, I’m still fully behind Martin O’Neill as we enter the final portion of the season. There are just seven games left so it’s pointless to be negative, especially when the play offs are a realistic target for the first time in years. I’m certain that Martin will have the side performing considerably better at Rotherham and in doing so providing those illusive back to back victories in the process. I said at the beginning of his tenure that I wouldn’t judge the manager until season’s end, and I meant every word. The order of the day certainly seems to be industry and endeavour over creativity, and I don’t think it will change before the final day of the campaign. Like every Nottingham Forest fan lucky enough to have witnessed the Brian Clough years, I’ve always been an advocate of playing the right way. However, after 20 years of obscurity beggars can’t be choosers regarding promotion to the Premier League. If it means grinding out seven ugly wins from now until May then so be it, at this stage of the season points are more important than performances.